Divorce litigation can be time-consuming and stressful, so many couples attempt mediation or arbitration in an effort to come to an out-of-court agreement regarding divorce-related issues, such as custody, alimony, child support, and property division. 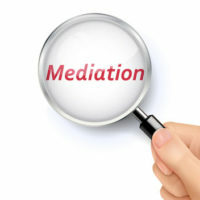 Although mediation is a good option for couples who are attempting to dissolve their marriages as smoothly, quickly, and inexpensively as possible, it is by no means an easy process, so if you and your spouse have decided to file for divorce and you have questions about whether mediation is right for you and your family, it is critical to speak with an experienced divorce mediation attorney before going forward. Mediation is about negotiation, so although a couple’s emotions will undoubtedly be running high as they start the divorce process, it is important for the parties involved to remember that mediation is a non-adversarial proceeding. Speaking out of anger, refusing to compromise, and arguing are not conducive to the environment of mediation, so it is important for divorcing parties who are seeking a resolution through mediation to keep this in mind throughout the process. It’s also important to list all debts on a spreadsheet, whether or not they were taken out during the marriage or before the marriage took place. Examples include credit card statements, loan documents, and mortgage balances. Although it may be necessary at a later date to have more accurate appraisals conducted of certain assets, such as artwork, antiques, and collectibles, this type of list is a great starting point for couples who are attempting to divvy up their property during divorce. It is much easier for couples to negotiate financial matters, such as property division, child support, and alimony if the parties know what they can afford. Developing a budget can be crucial during this process, as it helps both sides gain an understanding of the expenses that need to be covered, whether they are related to the household, childcare, healthcare, or vehicles. Although this budget may change over time based on both parties’ incomes, changing childcare needs, or health crises, these documents can act as a good starting point for negotiations and will help all parties, the mediators, and the couple’s attorneys gain a better understanding of what type of property settlement would be realistic and serve the needs of all parties. To speak with experienced Fort Lauderdale divorce mediation attorney Sandra Bonfiglio, P.A. about whether mediation is right for you, please call 954-945-7591 or send our legal team an online message today.